Sunday was my sister-in-law's birthday. My dad made omelets for a bunch of us. He makes the worlds best omelets..according to me. They were delicious. Since we did the early morning thing, I decided to hang out at my parents house for most of the day, along with my older brother. We decided to watch a movie in our parents new home theatre room, which by the way is amazing. 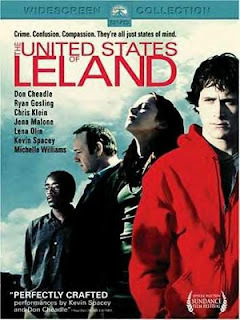 My dad chose "The United States of Leland". I thought is was a great movie and would recommend it to any of you who like a good thought provoking movie. After stabbing an autistic boy, the sixteen year old troubled and pessimist Leland P. Fitzgerald (Ryan Gosling) is sent to a juvenile detention. His teacher and aspirant writer Pearl Madison (Don Cheadle) gets close and tries to understand him, first with intention of writing a book, and later becoming his friend. Leland slowly discloses his sad vision of world. I think the movie may change the way some people look at the community and world that surrounds them. The movie depicts real life problems without extreme stereotyping. One part in particular that stuck out to me was a scene where Pearl, after having done something wrong, says "I'm only human". Leland in turn says "Isn't it funny how people only say that after they've done something wrong? No one ever says that after they rescue someone from a burning building." In the movie, Leland simply observes the world as it is. Another quote to get all you thinking. Leland: "And that's when I figured out that tears couldn't make somebody who was dead alive again. There's another thing about tears, they can't make somebody that doesn't love you anymore love you again. It's the same with prayers. I wonder how much of their lives people waste crying and praying to God. If you ask me, the devil makes more sense than God does. I can see why people would want him around. It's good to have somebody to blame for all the bad stuff they do. Maybe God's there because people get scared of all the bad stuff they do. They figure that God and the Devil are always playing this game of tug-of-war with them, and they never know which side they're gonna wind up on. I guess that tug-of-war idea explains how sometimes, even when people try and do something good, it still turns out bad."